BAGHDAD (Reuters) – The United Arab Emirates signaled its desire to strengthen ties with Iraq during weekend talks with influential Iraqi Shi’ite cleric Moqtada al-Sadr as part of efforts by Sunni nations of the Middle East to halt Iran’s growing regional influence. Sadr also discussed ways of improving understanding between the Sunni and Shi’ite branches of Islam, at a meeting on Monday with a prominent Sunni cleric in Abu Dhabi. The UAE is among Sunni nations which feel threatened by Iran’s increased power in the region, often projected through allied Shi’ite groups in Iraq and Lebanon. “The two sides emphasized the importance to act in true Islamic spirit and reject violence and extremist thought,” Sadr’s office in Baghdad said in a statement on his website on Monday, reporting on his meeting with Emirati cleric Ahmed al-Kubaisi. Closer ties with Sadr, who commands a large following among the urban poor of Baghdad and southern Iraq, would help Sunni states loosen Tehran’s grip over Iraq’s Shi’ite community and contain its influence. Sadr is one of few Iraqi Shi’ite leaders to keep some distance from Iran. In April, he became the first Iraqi Shi’ite leader to call on Syrian President Bashar al-Assad to step down, marking his difference with Iran and Iranian-backed Iraqi militias backing the Syrian government. “Experience has taught us to always call for what brings Arabs and Muslims together, and to reject the advocates of division,” the Abu Dhabi crown prince told Sadr, according to report on the Emirati state-run news agency WAM. The Iraqi cleric’s trip to Abu Dhabi comes two weeks after a visit to Saudi Arabia, where he met crown prince, Mohammed bin Salman..
Sadr’s office said his meeting with Mohammed bin Salman at the end of July resulted in an agreement to study possible investments in Shi’ite regions of southern Iraq. The Saudis will consider the possibility of opening a consulate in Iraq’s holy Shi’ite city of Najaf, it said. An influential Iraqi Shia cleric plans to visit the United Arab Emirates on Sunday, strengthening his ties with Sunni-ruled states of the Middle East. It will be the second such trip in as many months for Muqtada al-Sadr, who commands a large following among Iraq’s urban poor. He visited Saudi Arabia at the end of July . The Emirati government will send a special plane to fly Sadr to the UAE and return him to Iraq, according to a statement on the cleric’s website. The cleric is one of few Iraqi Shia leaders to keep some distance from Shia Iran, Saudi Arabia’s regional rival and the main backer of Syrian President Bashar al-Assad. In April, Sadr called on Assad to “take a historic heroic decision” and step down, to spare his country further bloodshed. Sadr’s office said his meetings end July with the Saudi crown prince, Mohammed bin Salman, resulted in an agreement to study possible investments in Shia regions of southern Iraq. The Saudis will also consider the possibility of opening a consulate in Iraq’s holy Shia city of Najaf, he said. Sadr also announced a Saudi decision to donate $10 million to help Iraqis displaced by the war on Daesh in Iraq, to be paid to the Iraqi government. Muqtada al-Sadr, the leader of The Sadrist Movement in Iraq, stated that visions were aligned during his meeting with Saudi Crown Prince Mohammed bin Salman in Jeddah last month. Al-Sadr said that Riyadh serves as a “father figure” in its efforts to bring peace to the region. In an interview with the London-based Asharq Al-Awsat newspaper on August 11, 2017, al-Sadr said that the two parties discussed several files of concern to the region, including Yemen, Bahrain, Syria, Jerusalem, Iran-Saudi relations, as well as Baghdad’s ties to Riyadh. He characterized the meeting as being transparent and honest. Al-Sadr pointed out that all the conflicts in the region can be solved gradually even if it took time, noting that this includes the status quo between the four countries Saudi Arabia, Egypt, Bahrain and the UAE, on the one hand, and Qatar, on the other. He believes that Qatar showed reluctance to compromise, but will eventually come to its senses. He also called for the stepping down of Assad, as the head of the regime in Syria, pointing out that when he is out of the picture, it would contribute to peace. As Tehran-backed Shia paramilitary units continue to expand their power and influence in Iraq, Iran has been implicated in the bombing of a Shia shrine in Samarra that triggered a sectarian bloodbath more than a decade ago. While this accusation is nothing new, the significance of the allegation’s resurgence is that it comes from a militant Shia Islamist movement that had long been a recipient of Iranian financing, arming and training. The astonishing about-turn from one of Iran’s Iraqi allies comes as Baghdad continues to be rocked by the interventionist policies of foreign powers. The United States has been implicated in a deadly attack against Shia militants near the Syrian border, while Turkish politicians have threatened that Ankara may intervene in Iraq, based on treaties that are almost a century old. With Iran continuing to play a dominant role across the full spectrum of Iraqi political, economic, cultural and security affairs, sovereignty continues to elude the war-ravaged country. A senior leader of the Sadrist Movement, led by firebrand cleric Muqtada al-Sadr, has directly implicated Iran in the 2006 Askari shrine bombing that triggered a wave of sectarian bloodletting that lasted for years and cost the lives of tens of thousands of Iraqis – mostly Sunni Arabs. The effects of the sectarian slaughter are visible to this day, with continuing examples of torture, murder, sexual violence and other atrocities having their roots in the violence that erupted in the bombing’s aftermath. Speaking to Dijlah TV on Sunday, Awad al-Awadi said that Iranian operatives had infiltrated Iraq around the time of the Askari bombing, saying “many reports have revealed that there were interests, there were terrorist cells and groups that came in from Iran”. Awadi alleged that Iran had wanted a sectarian war that would pit Iraqis against each other, and ultimately weaken any chance of national reconciliation or future Iraqi sovereignty. The Askari shrine bombing took place in Samarra, a Sunni Arab-majority city just north of the capital, and was blamed on al-Qaeda extremists – though no group formally took responsibility. Previously, al-Qaeda had been known to claim any attacks against Shia targets in order to boost its propaganda image of being a defender of the Sunnis, but then-leader of al-Qaeda in Iraq, Abu Mosab al-Zarqawi did not make any of his usual grandiose statements claiming responsibility. He was killed later that year. However, since the attack, many have suspected Iran of ultimately being behind the bombings, with reports from WikiLeaks purporting to show that Tehran was actively supporting al-Qaeda by supplying them with innovative explosives for carrying out suicide bombings. More recently, the US Treasury sanctioned three senior al-Qaeda operatives in 2016, all of whom reside in Iran with Tehran’s knowledge and consent. This has led to claims that Iran had the most to gain by the sectarian conflagration that followed, and was either directly or indirectly behind the attack. The shocking allegation comes amid Saudi Arabia’s recalibration of its strategy in Iraq, as Riyadh moves closer to long-time pro-Tehran stalwarts. Riyadh has increased its diplomatic presence in Shia holy cities in its northern neighbour, and has paid millions of dollars towards “legitimising” some Shia leaders over others – seemingly in an attempt to tip the scales more in its favour versus its regional foe, Iran. That the allegation comes from a Sadrist leader is interesting in itself, as the Sadrist’s militia at the time, the Army of the Mahdi – better known as Jaysh al-Mahdi, or JAM, to counterinsurgency experts in the US military – was heavily involved in the sectarian killing spree. The Sadrists targeted Sunnis in Baghdad and other major Iraqi cities, alongside many Shia militants, including the Badr Organisation that controls the interior ministry to this day. However, following Sadr’s visit to Saudi Arabia last week at the invitation of Crown Prince Mohammed bin Salman, the Shia cleric has adopted a more conciliatory stance towards Riyadh, offering to remove anti-Saudi posters in areas under his control. Saudi Arabia also took the step of blessing Sadr’s visit with $10 million to open a Saudi “presence” in the Shia holy city of Najaf, as a way of demonstrating Sadr’s influence and Saudi largesse all at once. Sadrist statements implicating Iran in one of the most heinous bombings in post-invasion Iraq are therefore likely to be intricately tied to Riyadh’s charm offensive and attempts at prising Shia leaders out of Iran’s grip. Another side-effect of Sadr’s visit to Saudi Arabia was his call last Friday for the Iraqi government to dismantle Shia paramilitary organisations that have been formally absorbed into the armed forces. Sadr called upon Prime Minister Haider al-Abadi to dissolve the Popular Mobilisation Forces, saying that “disciplined members” of the Iran-backed militia should instead be “integrated into the army”. While the PMF, or Hashd al-Sha’abi in Arabic, is part of the armed forces, it operates as a parallel army to the main national army. The PMF has its own budget, barracks, equipment and most of its recruits come from pro-Iran Shia Islamist militant factions, including some associated directly with Muqtada al-Sadr’s militias. The PMF is at least nominally under the command of Baghdad, but statements released by the group show that they appear to take their orders from Iranian Major-General Qassem Soleimani, the commander of the Islamic Revolutionary Guard Corps’ elite Quds Force. Despite claiming to have been established by religious decree to fight Islamic State group militants in Iraq, the PMF has detachments inside Syria and are actively helping Syrian President Bashar al-Assad crush the uprising against decades of Ba’athist rule. Sadr’s call was almost immediately shot down by the government, as Abadi not only flatly refused to dissolve the PMF, but said that the controversial organisation would stay with government and religious backing. Speaking at an event organised by the PMF on Saturday, the Iraqi leader said the PMF would “never be disbanded, and will remain under the command of the state and the religious authorities”. Abadi’s remarks have raised concerns that the transformation of Iraq into a theocratic rump state under the influence of ayatollahs both in Iraq and in Iran with a religious armed force to enforce the status quo will kill any chance of Iraqis obtaining the democracy promised to them by the United States when it invaded and toppled Saddam Hussein in 2003. By legitimising and strengthening the PMF and other armed factions, Abadi has shown that continuing torture in Iraqi prisons perpetrated by sectarian elements of the Iraqi armed forces primarily against Sunni Arabs is not an issue that concerns him as he struggles ahead of the general elections due next year. The continuing torture – as well as the transformation of homes in Mosul into headquarters for the Iraqi Hizballah – are leading to fears that political failures will lead to a revival of the circumstances that led to the rise of IS in the first place. While Saudi Arabia and Iran increasingly have their say in Iraq, other major powers – including the United States – continue to try to secure their interests in the country. IS has not been the only target of American airstrikes, as the PMF accused the US of bombing its positions in Iraq, leading to the deaths of dozens of fighters as well as Iranians fighting alongside them. According to Iraqi military sources, as well as the PMF itself, a pair of American air raids killed no fewer than 60 Shia militants in two separate strikes, all on the Syrian border. At least 20 of the casualties came from one group, the Tehran-leaning Sayyid al-Shuhada Brigades militia, one of the many militias under the overall control of the PMF, and under the command of Iranian military leaders. The Brigades vowed they would retaliate against the US, saying they would “not be silent” after the attack. Although the US has denied any involvement, one of the strikes hit the Iraqi side of the border near al-Tanf, the site of several such incidents in Syria, where a US military outpost is positioned. Washington has been quietly concerned that Iraqi Shia extremists to whom they have provided air support in the fight against IS are being quietly sent across the Iraqi-Syrian border on Iranian orders to threaten US interests in Syria. Two of Iraq’s most influential Shiite figures are in favour of disbanding the Shiite-majority Hashd al-Shaabi paramilitaries and placing them under the complete command and control of the regular Iraqi armed forces. “Sadr is worried that these groups will directly challenge him for the Shiite street after the war is over. They are also aligned with Vice President Nouri al-Maliki, another rival of Sadr,” Wing elaborated. Sadr is “more open” to groups like his own Saray al-Salam and the Al-Abbas Division, which is loyal to the Shiite establishment headed by Sistani in Najaf. The commander of the Al-Abbas Division, Maitham al-Zaidi, recently said he is under instructions not to meet any figures who aren’t part of the Iraqi Security Forces (ISF), a clear indication that Sistani and Najaf oppose the continued existence of a Hashd fighting-force not under complete state command and control. Al-Abbas has also worked closely with the ISF. “Sadr’s position is rather ironic because he wants to be the rebellious one of the Shiite establishment, but now is threatened with being usurped and losing his base along with other parties to the pro-Iran groups,” Wing pointed out. Wing concluded by pointing out that Sistani “does not want the pro-Iran Hashd to increase Tehran’s influence within Iraq,” and recalled that from the beginning, with his 2014 fatwa, the ayatollah never endorsed the creation of such a paramilitary force. When Islamic State (ISIS) captured Mosul in June 2014 Sistani, the leading Shiite religious authority in Iraq, released a fatwa calling on Iraqis to join the country’s regular armed forces to defend Iraq against that threat, not to form paramilitaries in order to do so. Nevertheless, the Hashd al-Shaabi paramilitaries were formed to fight ISIS while the regular army got back on its feet after its infamous retreat from Mosul. Many Shiite leaders defend the continued existence of the Hashd, especially those whose groups have close ties with Iran. They haven’t, however, been fully demobilized and integrated into the armed forces. As the defense journal Jane’s 360 noted last year, the law “will not increase government oversight or influence” over the Hashd. “Unfortunately, Tehran is also able to use them to legitimize the Hashd by presenting the involvement of these professed nationalist factions as if they represent the overall aims of the organization,” Orton told Rudaw English. Orton points to “an ideological distinction between Sistani and Sadr, who conceive of political order within an Iraqi framework, and the most powerful Hashd battalions that are loyal to Iran’s Supreme Leader” Ayatollah Ali Khamenei. “There is also the more prosaic aspect of the power-struggle: for both Sistani and Sadr, the Iranians and their proxies are the main competitors for influence,” he concluded. 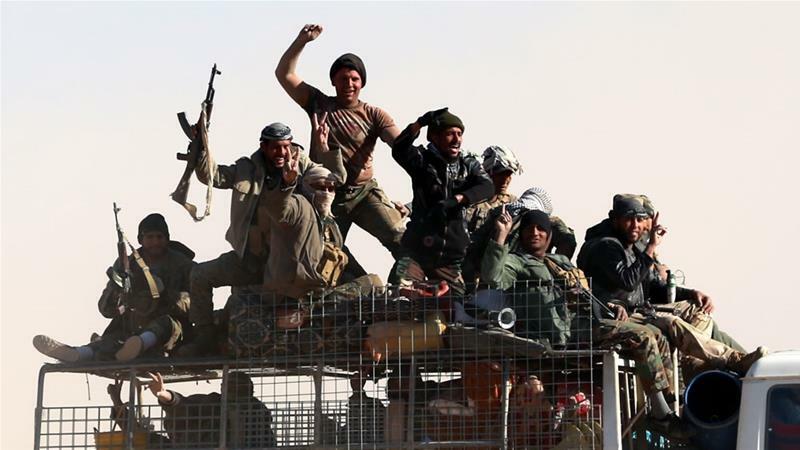 For now, the Hashd is a very formidable force in Iraq with an estimated 110,000 fighters. When driving ISIS out of Mosul the Iraqis used their best soldiers, the elite Golden Division, as shock troops backed by US-led coalition airpower. The Hashd sat out of that battle as the United States feared their participation would inflame sectarian tensions. They suffered fewer casualties than the regular forces as a result, which has left it in a position of significant strength. While the Hashd also continues to have powerful supporters like former Prime Minister Nouri Maliki and other Iranian-supported leaders in Iraq, it also has influential opponents in both Sadr and Sistani. Can Muqtada Al-Sadr Defuse Tension Between Riyadh and Tehran? Shehab Al-MakahlehShehab Al-Makahleh is a senior journalist who has written for various media outlets and newspapers around the world. From the Mahdi state to the Caliphate state! The peoples of the East generally believe in inherited legends which, over time, turn into an unreliable part of faith. The idea of the Caliphate state which was promoted by the Muslim Brotherhood is a set of inherited mythical fantasies that claim that the Prophet (PBUH) promised the Muslims a Caliphate state which will unite the Muslim world under the same flag. Naturally, this Hadith is challenged by many and is not proven by the authorities and scholars. In fact, the caliphate state is an idea which emerged after the death of the Prophet, and it is improbable that he had recommended it. However, the mixing of some of the Hadiths with fixed historical facts has created a kind of sanctity in the contemporary Islamic mindset. The caliphate state, which they say will materialize at the end of time, is the basis of most of the Muslim political movements. At the forefront of these movements is the Muslim Brotherhood. Among those who adopted this mythical idea is also ISIS, which shed the blood of many people, sowed destruction in countries and displaced people for the sake of the Caliphate state. In the end, all its efforts failed. They based their entire war and propaganda on a Hadith attributed to the Prophet which promised the emergence of this state at the end of time. In fact, it is believed that this state will conquer (Rome) in Europe, as is repeatedly vowed by its advocates. By the way, when Juhayman occupied the Grand Mosque, and pledged allegiance to the person who claimed to be the Mahdi under the Kaaba, he also believed in the heritage of another newly inherited prophesy that predicts that when the Mahdi emerges at the end of time, all the Muslims in the Haram will pledge allegiance to him. Consequently, an army will come from the north to fight his supporters. The defeat of ISIS and the idea of the state of the Caliphate, which some claim will emerge as strong as the Caliphate state in the beginning of Islamic history, requires us to purify our heritage from these myths that are not based on logical context as much as on the logic of miracles. The story describes how the soil would crack and swallow the army and that the Mahdi and his supporters would conquer all. Yet, the truth was something else, something that is far away from myths and legends. The question that we should urgently ask within this context is whether the fall of the so-called Caliphate State, along with the horrendous fall of ISIS, would fortify the Islamic mind and keep it from accepting these inherited heritage legends, which invade the law of logical causality under the pretext of the sanctity of the Prophet and make the miraculous supernatural somehow believable. Just like the Juhayman incident and the myth of the Mahdi cost us human and psychological losses at the beginning of the current Hajri century, history is repeating itself. The same idea of the mythical state of the Caliphate cost the whole world human and material losses, which can be seen on the ground. In the end, it turns out that states are not based on desires or metaphysical reasons, but on rational reasons justified by reality, not by the cosmic law and miracles. Hence, young people must realize that they were taken for fools. Indeed, some of the inherited heritage texts are only a form of rational abuse and myths. ERBIL, Iraq — Objections to the Iraqi Kurdistan’s referendum scheduled for Sept. 25 have gone beyond the political arena. Mosques are now involved, and religion is being inserted into the equation of supporting or opposing the calls for an independent state. Religious authority Mohammad Taqi al-Madrasi reiterated his previously stated opposition to independence in a July 28 sermon and advised the Kurds “to limit their demands to the confines of sense and reason and to the constitution.” Mohammad Mahdi al-Khalsi, the religious authority in al-Kazimiya, called on all Iraqis July 7 to stand up against “divisive projects” and asked to put a nail in the coffin of this “suspicious” project. He also warned the Islamic world against forming a new Zionist entity that is Kurdistan. Ayatollah Qasim al-Tai said in a statement on Jan. 25, 2015, that he firmly refuses the independence project. Grand Ayatollah Ali al-Sistani, the most influential religious figure in Iraq, has remained silent on the topic. Arab Sunni clerics also had a say. Sheikh Ahmad al-Kubeisi who is well-known in Iraq reiterated that he supports Kurdish stances in a post published July 19. He said, “Iraq will be divided. The strong Sunni area will be Kurdistan, and it will not be restricted to the Kurds, but all Arab Sunnis are insistent on joining it.” Arab Sunnis, especially in disputed areas, support the referendum and want to join the Kurdish region. With the nearing referendum, Iraq might witness tenser religious interventions in addition to fatwas and different religious stances. Meanwhile, there are no tangible guarantees that armed militias will not dive right into the conflict. 2017 has been a year of surprising headlines. Perhaps none more so than that of the visit of Moqtada Al Sadr, the Iraqi Shia cleric and leader of the populist Sadrist movement, to Jeddah last week. Greeted by Thamer Al Sabhan, the Saudi minister for Arabian Gulf affairs, who was withdrawn from Riyadh’s embassy in Baghdad last year due to heightened tensions between Iraq and Saudi Arabia, Mr Al Sadr went on to meet Crown Prince Mohammed bin Salman. Although no media statements were given at the time, the picture of the two of them together spoke a thousand words. It reflected the possibility of the formulation of a new alliance in the region, with an active Saudi foreign policy in Iraq. After years of fraught and disjointed ties, Riyadh and Baghdad are finding ways to engage with one another. Ironically, Mr Al Sabhan was withdrawn from Iraq due to his open criticism of the Popular Mobilisation Units last October, and was seen last week greeting Mr Al Sadr, the most outspoken critic of the Iranian-backed, state-mandated armed groups. An emergence of an alliance between those who want to limit Iran’s military influence in Iraq and find a framework to escape the sectarianism that is plaguing the region could be one of the Middle East’s most surprising and stabilising developments. Mr Al Sadr’s trip comes after historic visits by officials from the two sides – starting with Adel Al Jubeir’s historic visit to Baghdad and culminating in Haider Al Abadi’s visit to Riyadh last May. It would, of course, be naive to think that these visits alone will be able to heal the deep divides between the two nations. Momentum has now been built and needs to be solidified, before it unravels. Only two years earlier, when Saudi Arabia named its first ambassador to Baghdad in a quarter of a century, similar hopes were raised, only to be quickly dashed. However, this time the outreach is happening at the highest levels of Saudi decision-making. Mistrust remains between the two countries, in part due to a severing of diplomatic relations after Saddam Hussein’s disastrous invasion of Kuwait 27 years ago. Official diplomatic exchanges were cut and many of Iraq’s then-opposition didn’t maintain the ties they fostered with Saudi officials during their years of exile. Haidar al-Abadi, Iraqi prime minister, has rejected a call by Muqtada al-Sadr, the powerful Iraqi Shia leader, to dissolve a controversial militia involved in battling the Islamic State of Iraq and the Levant (ISIL) group. Hashd al-Shaabi, a Shia unit alternatively called the Badr militia, was established in 2014 with the avowed purpose of fighting ISIL, also known as ISIS, after it captured vast expanses of territory in northern and western Iraq. “The Hashd al-Shaabi … is for Iraq and will not be dissolved,” Abadi said in the capital Baghdad on Saturday. “The next phase after liberating the land from Daesh is the battle of the unity of word.” Daesh is the Arabic term for ISIL. Hashd al-Shaabi has faced accusations of abuses against civilians in Sunni-majority areas. Last month, the Iraqi army recaptured Mosul, the country’s second-largest city, from ISIL, which overran the city in 2014. Speaking to supporters on Friday, Sadr called for dissolving Hashd al-Shaabi and absorbing its fighters in the Iraqi army. Sadr issued the statement after his visit to Saudi Arabia, where he held talks with the kingdom’s leadership. He met Saudi Crown Prince Mohammed bin Salman in the Red Sea port city of Jeddah and discussed issues of common interest, Reuters news agency reported on July 30. The visit came with the Gulf region embroiled in its worst crisis in years – a dispute between Qatar and four Arab countries led by Saudi Arabia which severed ties with Qatar. Sadr, an anti-American figure, commands a large following among the urban poor of Baghdad and the southern cities, including Saraya al-Salam, or Peace Brigades militia. On Thursday, Sadr issued a new call for protests in Baghdad and other cities to denounce “corrupt politicians” and demand reforms.